You may want to consider redirecting your web host’s domain name. Instead of parking a domain and leaving it pointing nowhere, or even worse leaving it making money for someone else, you can park it somewhere where you have the capability to modify its DNS settings. Some domain registrars allow you to do this through your domain registration control panel, or you can do it through your hosting account. Purchase the domain name you want to use. During the purchase process, set the nameservers to the same as the ones for your current hosted domain. Scroll to the Domains section and click Parked Domains. Type the name of the domain you want to park into the box and click Add Domain. It is important to note that cPanel doesn’t allow you to do this until the domain is registered and the nameservers point to the server. If you have only just registered the domain name, it occasionally takes a while for the registration to go through. You therefore may have to wait a couple of hours after purchasing the domain before you can park it. Change the redirection, if necessary. At this point, the domain is parked and automatically redirects to the primary domain in the hosting account. So web users who type in the domain name are automatically redirected to your primary domain. If you want the domain name to redirect somewhere other than the root of your primary domain, then click Manage Redirection. Type the full URL of the domain or file you wish it to redirect to in the box on the Parked Domain Redirection Page. If you are redirecting to a file, then you need to end the URL with a trailing forward slash (/). 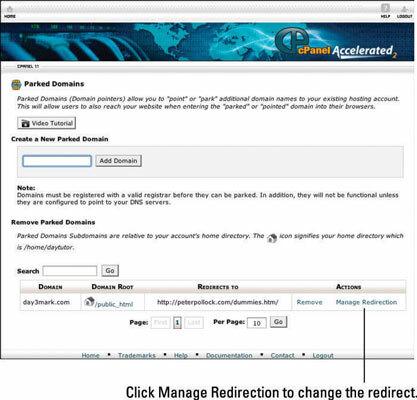 To remove the redirection, click Disable Redirection on the Parked Domain Redirection page. To remove the parked domain completely, click Remove on the main Parked Domains page.